Let’s face it, most girls love make up. It starts when we’re little, wanting to play in mom’s make-up drawer with red lipstick and rouge (does anyone even still say ‘rouge’ anymore?). It continues with battles in junior high over ‘How young is too young’ to start wearing make-up. And of course, it continues into adulthood when we’re always on the hunt for that life-changing, revolutionary color that will complete our make-up tool kit. Truth be told, I could have easily spent my part-time college paycheck on beauty finds back in the day, but as I’ve grown older and wiser, I’ve discovered the secret to making my beauty dollars stretch: “Gift with Purchase”. That’s right, I love when I can walk to my favorite beauty counter to pick up what I need and I walk away with a new makeup bag filled everything I need to put on the perfect face in the morning. I used to think drugstore cosmetics were the way to go because of the price, but inevitably I’d end up spending more money because I couldn’t actually try those products on before I purchased them. Once I realized I could sit down with a professional makeup artist at Macy’s and receive a free, customized consultation to find not only my perfect makeup colors but also receive great skin care tips and tricks, I was sold. This time of year is the perfect time to give your beauty routine a refresh since the holidays are right around the corner. 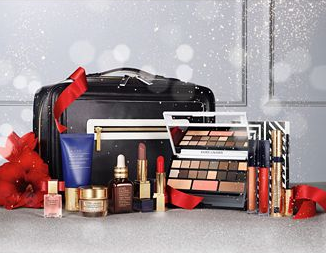 Obviously, Estée Lauder thinks the same way I do because right now they’re offering their Estée Lauder Fall 2016 Blockbuster Collection. 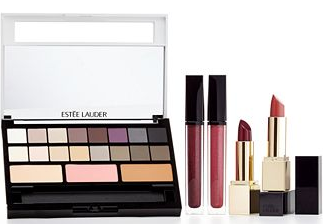 This 29 piece set (valued at $385) is only $62 with any Estée Lauder purchase (while supplies last). You also get to choose your Pure Color Envy Makeup Collection in Modern Nudes or Smoky Noir. A beauty offer this good won’t last long and I don’t want you to miss the opportunity to refresh your look before all those fabulous holiday parties coming up. Which collection would you choose?